Yesterday, Apple announced a minor refresh to their iPad portfolio, with improvements mostly focused on Touch ID and a thinner footprint. In many ways, this did feel like this was a "placeholder" upgrade. The new iPads would certainly appeal to loyalists, but they don't seem to target the primary reasons behind the recent slowdown. 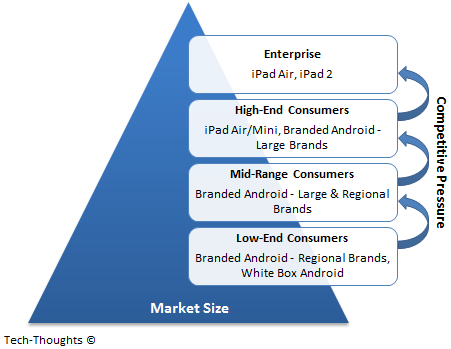 The slowdown in iPad sales (or high-end tablet sales, in general) was caused by three factors -- 1) Increasing overlap in use cases of large screen smartphones (or phablets) and tablets, 2) Inability to move downmarket, despite lower iPad Mini prices, because of competitive reasons highlighted in the chart above, and 3) Limited upmarket mobility because of a lack of developer focus around productivity. With the release of the iPhone 6 Plus, the first factor really plays into Apple's hands. If you have to cannibalize your own products, doing it with a higher margin product is the most painless way to go. The second factor is a market reality and there is little Apple or any other company can do about it. This leaves an upmarket move as the last remaining option to boost tablet sales. While Apple's IBM deal could help here, that is only a small part of the solution. In the enterprise, tablet use is still restricted to highly specialized use cases -- executives use them to take down notes, check email, etc. and sales staff in the field use them on the go. The primary issue is that developer innovation focused on tablet productivity has been minimal so far. Developers are partially to blame here because smartphones seemed like the more lucrative market. But OEMs and platform owners have to share some of the blame as well. Of all the tablets and platforms released so far, only the Surface Pro seemed to target productivity. Unfortunately, Microsoft made major sacrifices in ease of use and pricing to get there. Combined with their ecosystem handicap, this created a compromised tablet and PC experience. On the other hand, Google seems to have taken a step in the right direction with the Nexus 9's keyboard cover. While the Nexus 9 is unlikely to see meaningful sales, it could have a very "Nexus 7-like" impact. So far, tablets with keyboard attachments have remained a novelty. But if more OEMs go that route, it may finally pique developer interest in taking advantage of these accessories. In much the same way, I think Apple needs an iPad Pro to get developers to take an interest in productivity. In my opinion, this may be the only way to meaningfully increase tablet penetration in the enterprise.